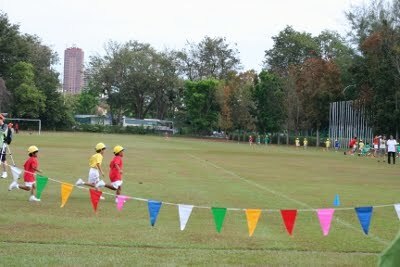 I went to see Arata's cross country race at Penang Sport Club ground. He ran with other boys in Year 1, about 30 of them. The truck looked much bigger than the 200M truck at Japanese schools. It must be 400M. There were a couple of obstacles on the way. To my surprise, they had to made 2 rounds! I was quite shocked and felt so uneasy to watch Arata. I really hoped he would finish the run, or he won't be the last one. In any case, I couldn't easily spot him. In the 2nd round, he took over a couple of others and finished at a bit behind the middle. It was Arata's first experience to take part in a race, which gives rankings. Apparently the first 3 kids got medals. I wonder how Arata felt about this. At Taska Nania, they also have a running race, but they never give children the rankings. Most of the first 15 were European kids. 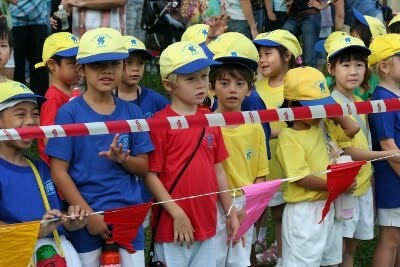 I felt helpless because they are much taller and more well-built, compared to Asian kids. And most of them like doing outdoor activities in such a hot country. So they have a good level of stamina, too. Well, unfortunately, Arata's figure is a typical Asian.